Human resource professionals help companies, governments, and nonprofit institutions hire and manage employees. Not only do these professionals help organizations grow, but they also create safe and productive work environments. A career in human resources is as financially rewarding as it is fulfilling. Human resource managers make a median salary of $110,120 a year, more than $70,000 higher than the national average. A human resources certification online is the first step to enjoying this lucrative career. What Else Can I Expect From an Online Certificate in Human Resources Program? 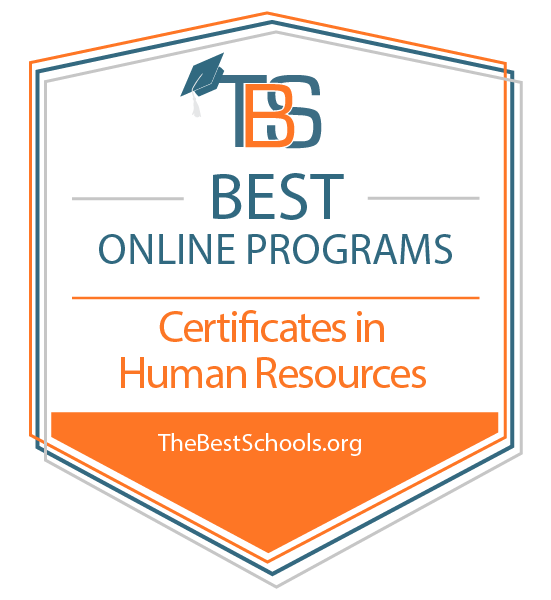 What Are the Best Online Certificate in Human Resources Programs? SNHU is a private nonprofit institution established in 1932 that serves over 73,000 students. The online human resource management certificate program enables online learners to acquire the essential skills to enter the business world. This certificate positions new learners for entry-level positions in human resources and provides current working professionals the opportunity to further develop their credentials. Over the course of 18 credits, SNHU students take courses that cover critical information for human resource professionals, including human relations in administration, organizational behavior, employee and labor relations and human resource strategy and development. Students begin asynchronous coursework at any of the six starting dates per academic year. Online learners can take two three-credit classes per eight-week term. At that pace, students can complete one of the best online human resource certificates in 24 weeks. FSU is a public institution in Michigan that offers an online human resource management certificate. Students in any major gain the knowledge required for entry-level supervisory and managerial positions in the human resources field. Students take up to four courses on topics such as human resource management, employment law, labor economics and compensation. Learners study how to best serve businesses and organizations while supporting and protecting employees. For admission, applicants should have a minimum 2.35 GPA and a minimum ACT score of 16 in English and 19 in math. While pursuing the human resources certificate online, students must maintain a minimum 2.0 GPA to remain in good standing. Incoming students may transfer up to six credits toward this 12-credit certificate. FSU is regionally accredited by the Higher Learning Commission. Established in 1969, IUPUI is a public research university located in Indianapolis. In this 32-week human resources management certificate program, online learners prepare for entry-level positions in the human resources field. In addition to a curriculum that aligns with the Society of Human Resources Management (SHRM) guidelines, this human resources certificate online program prepares distance learners to sit for the Professional in HR Certificate Exam and the SHRM Assurance of Learning Exam. Students need 18 credit hours of human resources coursework to graduate. Online students must pass each course with a “C” or better to remain in good standing. While there are no prerequisites to enter the certificate program, IUPUI encourages learners to complete college-level English composition and speech or rhetoric courses before applying. IUPUI is regionally accredited by the Higher Learning Commission. The school of engineering and technology is accredited by the Technology Accreditation Commission of ABET. Located in Burlington, Vermont, Champlain College is a private institution founded in 1878. Its online human resources management certificate equips newcomers in the human resources field with a respected HR credential. Working professionals who wish to bolster their resume and advance their careers also find value in Champain’s program. Students learn foundational skills in management and, upon graduation, can effectively recruit, hire, support, train and retain employees. Through courses such as managing talent, business law, conflict management and organizational communication, online learners obtain a thorough understanding of hiring laws, benefits packages, appraisals and employee rights. Students need 15 credits to complete this human resources certificate online. Each course in this asynchronous program is worth three credits and requires 15–20 hours of work per week. Online learners can work at their own pace and participate in online discussion with professors and classmates. Champlain is regionally accredited by the New England Association of Schools and Colleges. Established in 1993, STC is a public community college in the Texas Rio Grande Valley that offers a human resource assistant certificate. Online learners receive comprehensive human resources training and develop critical thinking techniques used by managers and supervisors across businesses and organizations. Over two semesters, learners take courses such as introduction to accounting, supervision, business conduct, organizational behavior, communications and human resources law for a total of 33 credit hours. While enrolled, online students receive support from STC’s student services office, including one-on-one academic, career and technical support. Upon completion of STS’s human resources certificate online, distance learners find employment as human resources technicians, assistants, specialists and benefits coordinators in diverse businesses. This program also prepares students to take the Professional Human Resources exam and meets licensure requirements in Texas. STC is regionally accredited by the Commission on Colleges of the Southern Association of Colleges and Schools. Established in 1918 in North Dakota, DSU is a public university serving 1,500 students. The online human resource management certificate requires six courses. Online learners explore the components of assisting higher-level managers and executives in businesses and organizations. With classes like management and leadership, human resource management, organizational behavior, ethics and critical thinking and an independent study course, distance learners position themselves for success in the field. Online learners complete 16 credit hours for graduation. Applicants should have a minimum 2.5 high school GPA and the successful completion of at least one accounting course. The chair of the business department can waive these requirements for applicants with documented professional work experience. STC is regionally accredited by the Higher Learning Commission. The school of business is accredited by the International Accreditation Council for Business Education. One of seven schools in the University of Maine System, UMM is public institution founded in 1909. Distance learners can pursue a human resources management certificate [PDF] that offers flexibility and comprehensive management training. Over 18 credit hours, consisting of five required courses and one elective, students obtain essential critical thinking and communication skills. Required courses include labor relations management, ethics and social responsibility, management, negotiations and human resource management. Distance learners choose an elective aligned with their academic or career goals, such as leadership, project management, decision-making, or human behavior. Applicants must submit official transcripts, SAT or ACT scores, high school class rank, a personal essay and a list of extracurricular activities. Transfer students must have at least a 2.0 GPA. Financial aid is available for distance learners. All students in UMM’s online human resources certificate program must submit a FAFSA for consideration. UMM is regionally accredited by the New England Association of Schools and Colleges. MSU Billings is a public state university founded in 1927 that serves over 4,400 students. Its certificate of applied science in human resource management is offered through City College, MSU’s online platform. This program focuses on fostering strong communication and business skills in learners. With courses like business writing, communicating in a dynamic workplace, accounting and payroll accounting, graduates of MSU Billings are ready for assistant, managerial and supervisory work in human resources and business. Distance learners must complete 32 credits. Most students take 15 credits during their first semester and 17 in the second to complete the certificate in one academic year. Applications for this online human resources certificate program must include official high school transcripts and ACT or SAT scores. Accepted students at MSU Billings typically have a 2.5 GPA or higher and at least a 22 on the ACT or 1030 on the SAT. MSU Billings is regionally accredited by the Northwest Commission on Colleges and Universities. HU is a private historically black university established in 1868. Distance learners can pursue a certificate in human resources management without any on-campus obligations. This program helps newly promoted professionals and those preparing for career advancement to strengthen their resumes. Additionally, new students preparing to enter human resources or business gain the necessary skills and qualifications at HU. The HU certificate also prepares graduates for the Human Resource Management Certification Exam. This comprehensive, competency-based program requires 24 credit hours. Online learners take courses such as employment law for business, business communication, organizational behavior and labor management relations. Full-time students can complete the certificate in two semesters or one academic year. Distance learners in this online human resources certificate program receive online access to HU’s library and career services. Students also gain access to online chat assistance during business hours for questions. HU is regionally accredited by the Southern Association of Colleges and Schools Commission on Colleges. BC3 is a two-year community college in El Dorado, Kansas. Among the school’s 37 career programs is the human resources management specialist certificate. The program helps new students enter the job market and working professionals advance their careers. As they develop practical and theoretical human resources knowledge, online learners explore essential topics in human resources such as communications, employment law, labor relations, strategic leadership management, staffing compensation and employee training. The program also prepares students for the national Society for Human Resource Management certification. All students must complete at least 33 credits. Over the span of two semesters, certificate candidates obtain training in courses like employment law, college writing, labor relations and business ethics. BC3 has an open admissions policy and does not require standardized pre-admissions testing. All students with a high school diploma or GED may enroll in classes at BC3. BC3 is regionally accredited by the Middle States Commission on Higher Education. Established in 1961, PCC is a two-year accredited college located in Winterville, North Carolina. Students can earn the 18-credit human resources management certificate with no on-campus obligations. Distance learners take courses such as human resource management, employment law, organizational behavior in business and recruitment. With a focus on management principles, certificate candidates develop competencies in marketing, finance, legal aspects of business and communications. Upon graduation, certificate holders know how to conduct employee training programs, recruit new employees, develop personnel policies and procedures and design compensation programs. PCC has an open admission policy. Prospective students need a high school diploma or GED and must complete a residency determination request to determine their tuition status. Online students pay the same tuition rates and fees as on-campus students. PCC is regionally accredited by the Southern Association of Colleges and Schools Commission on Colleges. Thomas Edison State University is a public liberal arts college established in 1972. Its online undergraduate certificate in human resources management is an 18-credit, cohort learning program which can be completed in one year. With a curriculum built around foundational topics in management and business, the certificate prepares distance learners for jobs in the human resources field. Online courses take 12 weeks and can include proctored midterm and final exams through the Online Proctor Service. Incoming students may transfer up to nine credits toward this human resources certificate online. Applicants must be at least 18 years old and possess a high school diploma or GED. Financial aid is available through the university and outside sources in the form of grants, loans and scholarships. Active-duty military receive a substantial tuition discount and may be eligible for an application fee waiver. Thomas Edison State University is regionally accredited by the Middle States Commission on Higher Education. Located in Rosemount, Minnesota, DCTC is a public, two-year institution serving over 3,000 students. Students may complete its 17-credit human resource management certificate in a hybrid or online format. By completing courses in workforce planning, risk management, human resource development and compensation and benefits, distance learners prepare for entry-level and mid-level positions in the human resources field. DCTC graduates work for entrepreneurial businesses, government agencies and corporations. Certificate holders may hold professional human resources positions such as quality specialists, event managers and team supervisors. Online courses at DCTC follow the traditional semester schedule but may have a synchronous or asynchronous format. This school has an open enrollment policy. Applicants must have a high school diploma or GED, submit their transcripts and complete a placement exam. DCTC is regionally accredited by the Higher Learning Commission. DCCC was established in 1958 and serves over 5,700 students. This two-year college offers more than 50 programs of study available on campus, online and in hybrid formats. Its business administration certificate with an emphasis in human resources management is a 12-credit program available in a hybrid format. Online students take four required courses: introduction to computers, human resource management, training and development and business law. Learners develop the essential problem-solving, communication, motor and professional conduct skills to meet the demands of the modern business world. DCCC has an open enrollment policy. All applicants with a high school diploma or GED are admitted depending on space and resources. DCCC scholarships, federal and state grants and federal work-study programs are available to online students. About 75% of DCCC students receive financial aid. All applicants must complete a FAFSA. Founded in 1887, Benedictine University is a Roman Catholic-affiliated, private institution with over 5,000 students. Its human resources management certificate [PDF] program is available entirely online to distance learners worldwide. Students learn to analyze, interpret and administer workplace relationships that optimize employee performance and the work environment. Benedictine distance learners complete courses such as fundamentals of human resource management, recruitment strategies, performance and appraisal management, law and risk management and managing workplace relationships. Students must complete six classes for a total of 18 credits for graduation. Each course takes five weeks. The entire certificate program takes less than eight months to complete. Benedictine has rolling admissions and does not have a deadline for new applications. Applicants should apply early in their high school senior year to begin courses the following fall semester. Admitted students typically have a 2.5 GPA or higher with minimum scores on the ACT and SAT of 21 and 1060, respectively. Benedictine is regionally accredited by the Higher Learning Commission. CCCC is a public two-year college with multiple campuses in North Carolina. Distance learners can earn a business administration human resources management certificate [PDF] entirely online. This business-heavy curriculum gives students skills in areas such as management, marketing, economics, accounting, finance and law. CCCC’s diverse program ensures that certificate holders have the necessary business and management knowledge to make a positive impact on any business or organization. Learners take required courses such as people skills, employment law and human resource management. Students complete 18 credits for this online human resources certificate program. Full-time students can complete the certificate in two semesters. All applicants receive provisional admission to the college. For full admission, students must complete a placement exam and residency determination. Benedictine is regionally accredited by the Southern Association of Colleges and Schools Commissions on Colleges. Cedar Crest is a private, liberal arts women’s college established in 1867. While some on-campus majors are reserved for women, any admitted individual may earn a Cedar Crest degree or certificate online. Distance learners can obtain a 12-credit human resources management certificate. Most students complete this certificate in two semesters. New students may transfer credits toward their certificate. Students must complete 75% of their coursework at Cedar Crest. This human resources certificate online gives students necessary career skills for the field. Upon completion of the program, students can evaluate legal and social conditions within the workplace; manage and hire employees; understand employee compensation and benefits; and use political, legal and economic tools to improve an organization. Applicants must submit an online application, official high school transcripts, personal essay and SAT or ACT scores. Cedar Crest is regionally accredited by the Middle States Commission on Higher Education. The business program is accredited by the Council for Business Schools and Programs. Wake Tech is a two-year community college with over 74,000 students. Learners can earn a human resources management certificate on campus, online, or in a hybrid format. Online and blended learners must complete 12 semester credit hours for the certificate. Wake Tech requires four courses: human resources management, principles of management, business ethics and organizational behavior in business or business communication. Hybrid courses are available at the Southern Wake, Scott Northern and Research Triangle Park campuses. Students can complete this certificate in two semesters. Students pursuing a human resources management certification online can take advantage of Wake Tech’s open-door admissions policy. Any applicant with a high school diploma or GED may enroll in classes. Prospective students must submit an online application, FAFSA and official high school transcripts as well as take a placement exam and attend a new student orientation. All students, on campus, blended, or online, pay the same tuition rates and fees. Wake Tech is regionally accredited by the Southern Association of Colleges and Schools Commission on Colleges. LCCC is a two-year college located in Schnecksville, Pennsylvania, with over 7,000 students. Students can earn the human resource management certificate in 12 months. Distance learners develop specializations in personnel and human resource topics. After completing the certificate program, distance learners demonstrate mastery of computer literacy; accounting principles and procedures; and organizational recruitment, training and development. Graduates can also perform tasks in compliance with state human resources regulations. Students need 30 credits to complete this online human resources certificate program. LCCC certificate holders can obtain entry-level positions in roles such as benefits coordinator, personnel records supervisor, training and development coordinator and recruitment specialist. LCCC offers open enrollment and admits all students provided they complete and submit the necessary application materials, including high school transcripts, FAFSA and placement exams. LCCC is regionally accredited by the Southern Association of Colleges and Schools Commission on Colleges. Located in Bloomington, Minnesota, Normandale is a two-year college with over 14,600 students. Online students who earn the human resource management certificate acquire skills in personnel and organizational policy, labor relations, employment law, compensation systems and recruitment and selection. Online learners need 18 credits to graduate, which consists of six courses using the Brightspace platform. Incoming students may transfer up to six credits toward the certificate. Students must maintain a minimum 2.0 GPA for graduation eligibility. Any student with a high school diploma or GED is eligible for admission to this online human resource certificate program. New students can apply online by submitting copies of their transcripts or GED certificate, and scores from the SAT or ACT. Incoming students must also complete placement testing and attend both an advising and registration session. Normandale is regionally accredited by the Higher Learning Commission. The business programs are nationally accredited by the Association of Collegiate Business Schools and Programs (ACBSP). Earning a human resource management certificate online helps students enter the profession quickly. The typical program lasts 12 weeks, but several factors influence program length, such as the primary subject of the certification. For example, introductory certificates with broad scopes, like human resource generalist and human resource management, may take four months or longer to complete. Conversely, specialized certificate programs for practicing human resource professionals can take as little as two months. Specialized subject areas include diversity, conflict resolution and social media in the workplace. The structure of a program also influences length. Students enrolled in a cohort model must graduate at the same time as their peers, while students in self-paced programs can graduate sooner or later than their peers depending on the pace at which they work. What Can I Do With a Human Resources Diploma? Unlike degrees, the best online human resources certificate programs take only a few months to complete and can cost less than $2,000. These programs are great alternatives for learners with time and budget constraints. However, some employers require candidates to have degrees before advancing to management positions. As such, many professionals use these certificates as a stepping stone to a degree. Most human resource professionals work in office settings. They must be personable with excellent communications skills. Certificate holders can start careers as generalists or specialists in the field. As they gain experience, these workers can become well-paid managers. Human resource managers at large companies often specialize in one area of the field, such as training or compensation. Those who work at midsize corporations may oversee all human resources operations. These professionals often have five or more years of relevant experience. Students can earn a certificate to start that experience and become management-ready by the time they earn a degree. Unlike their generalist counterparts, these managers focus solely on developing a company’s workforce. They coordinate training sessions and ensure all staff members have the education they need to be effective. These specialized managers compile compensation packages for new hires. They also coordinate raises with other managers and work with vendors to provide adequate benefits. These professionals often work under training and development managers to provide workforce development programs. These roles are often entry-level positions for professionals with human resources certificates. Human resources specialists screen applicants, conduct interviews and manage workforce relations. Candidates with certificates in human resources are qualified for these positions. Each human resources certificate program has a unique structure and courses. However, there are several subjects that most online human resources certificate programs cover. Students learn the purpose of human resources, studying core topics that human resource professionals must know. These classes lay the groundwork on which all other human resource courses build. These courses give students the skills to effectively recruit, train and retain staff. Learners also develop communication and critical thinking skills. Some courses cover the basics of cultivating effective company cultures. In these classes, certificate candidates learn fundamental compensation law and payroll techniques. Because compensation packages often include benefits in addition to salary, these courses usually cover insurance options. These courses teach certificate candidates how to approach and manage conflicts in the workplace. Topics may include sexual harassment and discrimination. These courses teach students to evaluate resumes, conduct interviews and make employment offers. Certificate candidates may also learn about recruiting in the social media age. Some universities that offer certificates in human resources allow students to transfer certificate credits if they pursue degrees. However, certificate programs are more often self-contained. Even when credits do not transfer, certificate holders benefit from pursuing degrees, as many companies require their employees to hold bachelor’s degrees or higher. These two-year programs expand on what students learn in certificate programs. Graduates develop a deeper understanding of human resources theories and how to successfully apply the theories to the workplace. As a four-year degree, a bachelor’s in human resources demonstrates that a graduate understands the profession. In these programs, students learn about human resources theories, research, laws and ethical considerations. These programs focus on the management aspect of human resources. Students gain critical thinking, oversight and communication skills that help them guide teams of professionals. International organizations face unique employment challenges. Students in these programs learn how to overcome legal, social, cultural and language challenges in global teams. Students with undergraduate degrees in any subject can earn a master’s degree to advance their human resources career. These programs delve into the complexities of human capital management. Employers recognize these graduates as experts. Although certificate programs do not require core college classes, applicants should still consider an institution’s accreditation status before enrolling. Students that graduate from a school with institutional accreditation enjoy more financial aid and employment opportunities than students from unaccredited institutions. Furthermore, universities are unlikely to accept transfer credits from unaccredited institutions. Universities can receive one of two types of institutional accreditation: regional or national. Regional accreditation is typically considered more prestigious than national accreditation. Students should also consider programmatic accreditation, which applies to a specific program within an accredited school. Because many human resources certificates come from business schools, learners should look for programs that the Association to Advance Collegiate Schools of Business certifies. This national organization ensures the highest standards of business education.